Sitting at the computer one evening some weeks back, just catching up on news and posts, a certain title story caught my eye, something like ‘Let’s just stop already it on the grill stuff for Dad’s on Father’s Day.’ So I read it out loud, enough for those on the first floor to hear. The response from the Dad in my house was to immediately shoot up from his office seat remarking in a nervous sort of tone ‘But that’s what I really want, grill stuff.’ I could feel a relieved hush from the side room as my eldest, Sooky the Stylist, had already planned a grill follow up to last years Smoker, and after Dad’s mentions, on more than a few occasions, that he was quite keen to give a go on the newest version of the egg shaped grill for barbecuing. Now we might all generally agree that Dad’s sometimes have selective hearing, and this point of announcement hit the blinking red flash, select to hear, button. Having a fashion maven daughter, Dad was likely immediately terrorized on the idea of a trendy wrapped designer wallet or pair of shoes instead of his dream grill, and this was more than enough to even interrupt watching the Phillies game just to set the point clear. I clicked out of the article. Egg style grill secured, the same as last year, after receiving one of his favorite gifts of all time, the Smoker, Dad then immediately made a visit to the butcher to check out the meat selection and scheme out the plan for the following day. One of the day’s choice selection was a 6 pound Capon. Now a capon is not a pigeon, just to set the record straight, as I do know some who used to believe such on what is an appreciated succulent prize treasured in many parts of Europe, though not commonly available here, except through a private butcher. A capon is a castrated rooster and relieved of its frustrations is less hyper active and aggressive, thus much more tender with generous flesh and ample breast meat, as compared to a gamier taste produced by the un-castrated rooster. Though having knowledge in recognizing the distinction between a pigeon and a Caponized bird is a given in the household, a slight bit of confusion might occur if the capon is placed bagged in the refrigerator alongside bagged small roasting chickens regularly cooked for stock. Oops. Well in this case, the Capon for grilling on the new Egg style grill was accidentally tossed into the freezer. 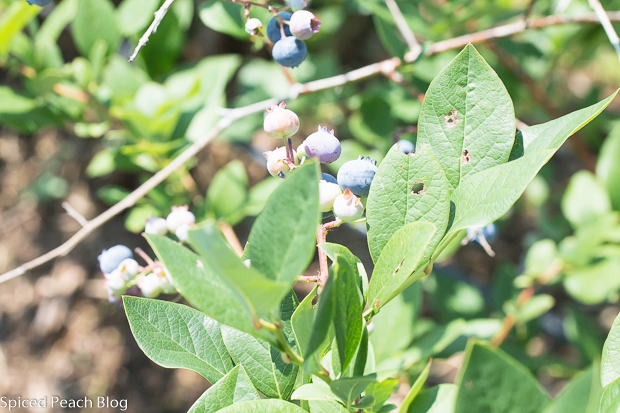 After a lovely day picking blueberries out at Terhune Farms in Princeton, New Jersey last week, a fresh Blueberry Salsa was definitely on the menu agenda. Blueberry Salsa is quite diverse in its use and could have been shared in any number of ways; this lively colorful combination simply scooped onto cup style tortilla chips, topped on a piece of fresh fish, or perhaps as part of a salad, but the deciding factor today was due to another, well another, Oops again. Thinking the capon in the bag in the freezer was a small roasting chicken for stock, this time I pulled it out and accidentally defrosted it. Hence, for Sunday dinner the following day, fortunately, Dad was ready and eager firing up his new egg style grill, that ‘grilling’ gift he really did most want for Father’s Day and its accompaniment displaying yet another of the diverse complementary combinations of blueberries and their uses, Herb Grilled Capon, Blueberry Salsa. Preheat wood or briquets. Salt pizza stone all around, if using. Pour a tablespoon or two of olive oil onto bird, sprinkle over some coarse kosher salt and pepper then rub all over. 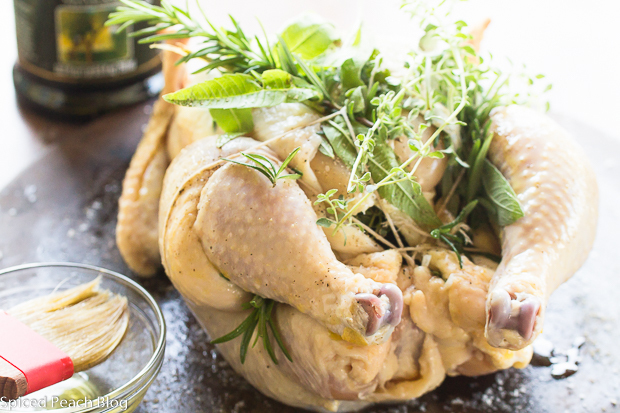 Place the lemon halves into the cavity of the capon, use kitchen string to tie bird if desired, then cover with the fresh herbs. Set capon onto the pizza stone, place onto grill and cover maintaining grill temperature at around 250 degrees for around 3 to 3 1/2 hours depending on type of grill and ability to maintain heat temperature. Capon may also be finished off in an oven at 300 degrees and same as a roasted chicken cooked until the juices run clear. Tent for ten minutes before slicing. Top with Blueberry Salsa. Combine all ingredients together in a glass bowl, pour in the lime juice and cider vinegar, stir. 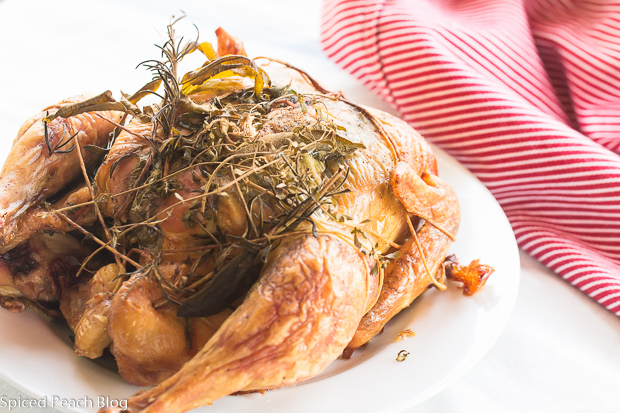 Serve on top of grilled capon. May also be served on chips, fish, pork, or any poultry. 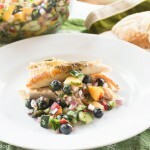 This entry was posted in Poultry, Salads and tagged Blueberries, Blueberry Salsa, Blueberry Salsa Recipe, Herb Grilled Capon, Herb Grilled Capon Blueberry Salsa. Bookmark the permalink. Post a comment or leave a trackback: Trackback URL. We have never prepared capon here, but we did in Spain. Our neighbors gifted us with one they had recently butchered and Antonio grilled it at the house. It was tough, but tasty. And the leftovers made great stock and stew. Glad Dad was able to grill his bird. After all, it’s about what they want, right? 🙂 Have a great week, Peggy! I’m going mostly off the grid for the next month as we travel. Enjoy the rest of your summer! Hugs! Hi Kelly, thanks so much. I’m surprised your capon was tough as they are known to be more tender. I cannot help but wonder if you had a rooster. Capons are especially delicious for Coq a Vin, and marinated overnight though we shall save that for the cooler weather months. Meanwhile, I shall miss you much over this next month and wish you and Antonio a wonderful time in Galicia, seeing family and friends, along with the adventures and journeys you will take along the way! Happy Trails! Big Hugs! You had me at blueberry. I’m a sucker for anything with blueberries. Phil recently posted…You just can’t fix stupid, and more blogging nonsense in NYC! Hi Phil, great to see you. Yes, I too love blueberries what a fantastic fruit! 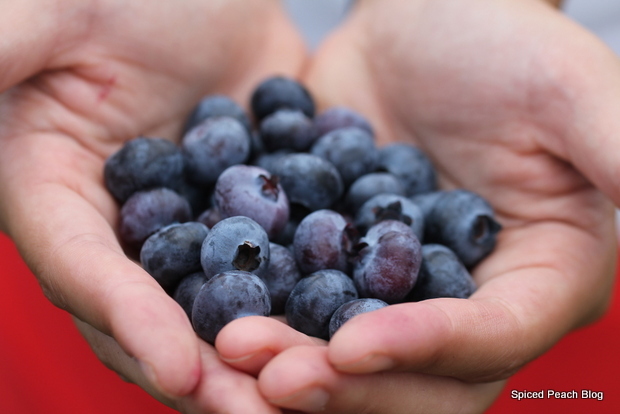 Blueberry Salsa is quite easy and versatile, great for picnics and barbecues too. Thanks for stopping by. 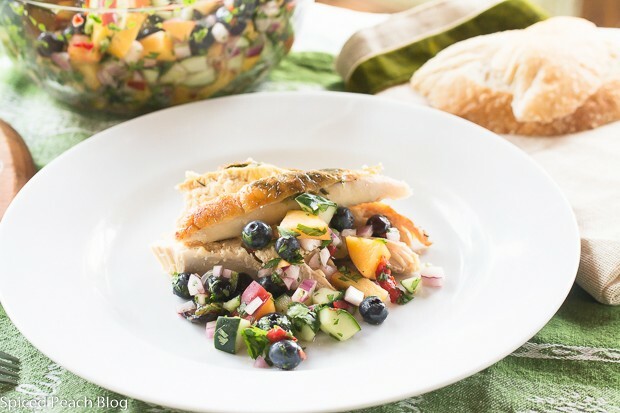 Peggy, fabulous photography and and terrific recipe – although I have never made a blueberry salsa before, I must admit that is sounds quite tempting – it must bring such a wonderful fresh flavor to your amazing looking capon! Hello Andrea, thanks so much. I love the blueberry salsa and bet you would enjoy it too. Topping the grilled capon was quite fun, though I do look forward to another capon for coq au vin in the cooler weather months. Hope you are well and I miss seeing you… I’m wrapping up a cooking frenzy stocking the elder family members freezers and delivering, a lot of work but then will be done again for awhile. Did enjoy the Hugh recipes this month! See you soon. Beautiful photos, and a healthy plate, I’m going to try this. Thanks for sharing, Peggy. 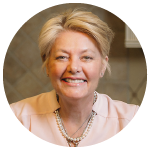 Hello Jolma, hope all is well at Beyond Her Kitchen. Thanks so much, I especially love the blueberry salsa from the fresh picked blueberries out at the Terhune Orchards. See you soon. I’ve heard of capon but have never seen one much less prepared one. It looks fabulous by the way. When I asked my butcher about capon she said they are difficult to find fresh outside of the Philadelphia and New York City areas. Can’t wait to try your recipe in my big green egg. Hello Jay, thanks so much. Looks as if you have a new recipe item to add to your own big green egg repertoire. Hope you find your capon soon, they are tasty. Thanks for stopping by. Once again, I am just going to drool at the thought of this blueberry salsa..wow Peggy! Hi Pragati! Thanks so much, I do love this blueberry salsa, catching the full burst of the berries contrasted with the hot green and red peppers, and then the tang. Gosh, this blueberry salsa may be one of my favorites yet. But then I do have a really, really, really good blueberry bread recipe upcoming. Hope you are enjoying the series of Hyatt Pune events featuring South Indian food this month, gosh do those dishes look sensational! Thanks for stopping by.